Dentures have been the go-to solution to replace missing teeth for decades. Today’s dentures have improved greatly over those from years past. They’re comfortable, fit snugly and allow you to speak and chew as you’d like with no concerns. The team at May St Dental Centre can fit you with the denture that’s right for you. Dentures are a removable device that replaces teeth. They’re available in two forms: conventional and immediate. With conventional dentures, they’re fitted when any extractions necessary have been performed and the area has fully healed. An immediate denture is fitted before the teeth have been extracted, restoring your chewing abilities straightaway after an extraction. Once you are ready to receive your dentures, you can have them in full or partial form. A partial is similar to a bridge and is usually fitted on only the upper or lower arch. It isn’t cemented into place and is fully removable just like a full set of dentures. When you first receive your dentures, we may recommend that you wear them all day and night. This continual wear allows us to locate any areas of discomfort that should be reshaped. After we are certain that the dentures are a perfect fit, you can remove them at night. Dentures can take time to get used to and may feel bulky at first, though over time they will feel natural. Though dentures aren’t real teeth, you should care for them like they are. Brush them to remove any food particles and put them in lukewarm water or a denture cleaner when you take them out. Be careful, as hot water can warp your dentures. Can I get my dentures repaired? If your dentures have started to feel uncomfortable over time, adjustments may be needed. We can address that as well as any needed repairs in the case of broken dentures. A minimal amount of time will be taken so that you have your dentures back as quickly as possible. 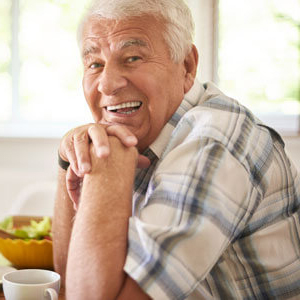 After a few weeks, however, you will feel comfortable eating and talking with your dentures in and experience little to no soreness or discomfort. If you ever do experience soreness or your dentures aren’t fitting right, please let us know. Contact May St Dental Centre today to book your time! All health funds are accepted.